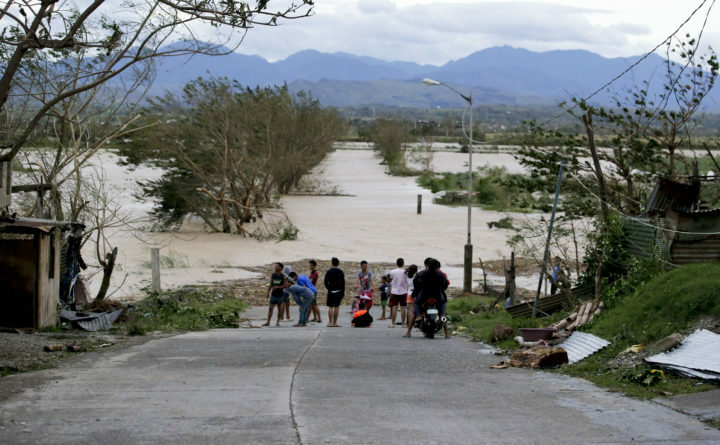 Residents stand by a flooded road following the onslaught of Typhoon Mangkhut in Tuguegarao city in Cagayan province, northeastern Philippines, Saturday, Sept. 15, 2018. Typhoon Mangkhut lashed the northern Philippines with destructive winds and heavy rain that set off landslides and destroyed homes on Saturday, leaving at least 12 people dead, as Hong Kong and other parts of southern China braced for the powerful storm. Mangkhut’s sustained winds weakened to 105 mph with gusts of up to 161 mph after it sliced northwestward across Luzon before blowing out to the South China Sea, aiming at Hong Kong and elsewhere in southern China.